These pH ranges are ideal for safe bio-active drinking water. Hydro-Chi Does Not use chemicals like sodium hyperchloride to help adjust the pH of the water or any other function. What makes the Hydro-Chi different from other water electrolysis machines on the market? 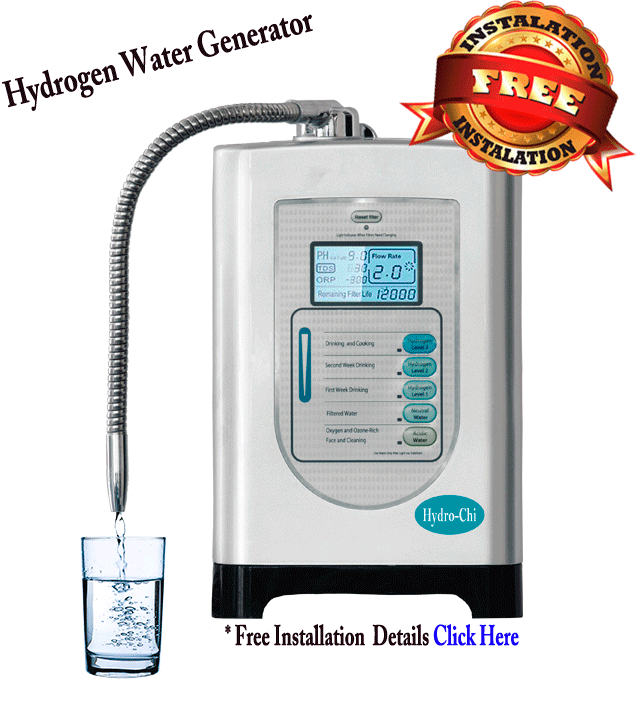 Most water electrolysis machines are designed to change only the pH of the water. The Hydro-Chi supplies alkaline water, but more importantly it produces hydrogen gas that can be seen in the water. As the Hydro-Chi water streams into your drinking glass, you can see the small gas bubbles forming inside the water. How Does the Hydro-Chi Produce Hydrogen? When electricity is supplied to water, the water molecules are split into oxygen and hydrogen. The Hydrogen gas is some of the most beneficial molecules produced in this process. The Hydro-Chi separates oxygen from hydrogen. The oxygen is expelled from the anode side as wastewater; the hydrogen is concentrated on the cathode side as high-quality drinking water. If you want to drink healthy, clean water with increased pH and an abundance of hydrogen, this is the machine for you! Hydrogen water has been shown to remove free radicals from the body. Use hydrogen to improve your health! Our Hydro-Chi is the answer. What Makes the Hydro-Chi Better than Other pH Water Machines? There are numerous water electrolysis machines on the market which are designed to produce chemicals which allow the machines to increase the pH of the water without concentrating more alkaline minerals in the cathode chamber. These lesser designed machines produce hydroxyl radicals (OH -) which combine to make extremely alkaline hydrides. However, while the water is alkaline, it does not contain increased hydrogen concentrations. 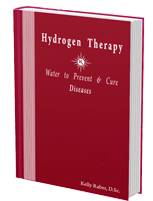 The Hydro-Chi was not designed to produce hydroxyl radicals; it was designed to produce an abundance of active hydrogen. Other water electrolysis machines on the market use sodium hydrochloride to change the pH of the water. The Hydro-Chi does not use bleach, aka sodium hydrochloride, to produce water. We have found that certain energy transforming stones can be used to increase hydrogen production without the need for costly and potentially dangerous chemicals. Our Hydro-Chi uses minerals found in ceramic and tourmaline to produce extra amounts of hydrogen gas. The minerals do not dissolve in the water, however they are able to store and release energy during the electrolysis process. 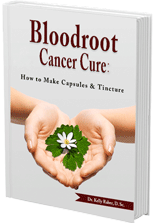 Essential to all life, water is able to permeate everywhere in the body including passing the blood-brain barrier—something that most of the antioxidants derived from fruit and vegetables are not able to do. Electrolyzed-reduced, hydrogen-rich water is an ideal choice of drinking water because of its very powerful antioxidant capabilities. Free radicals are widely known to cause extensive oxidative damage to cells which are believed to promote premature aging. Hydrogen-rich drinking water can potentially neutralize the toxicity of free radicals (active oxygen) as it travels throughout the body. Essential minerals, energy stones or precious metals can be added to the mineral port. This can increase the conductivity of the water and release bio-available nano-particles to be consumed as part of daily healthy water intake. Warning: Never introduce a dietary supplement, pharmaceutical drug or any other non-approved Hydro-Chi Mineral TM into the mineral port. The pH can be slightly adjusted on the 3 different alkaline settings and on the acidic setting. This helps you customize the machine to your specific water. Mineral concentrations will ultimately affect electric conductivity. Different types of minerals will also affect the pH achievability. Electrolyzed reduced water can act as a free-radical scavenger. Adults interested in reducing free radicals inside the body should drink 2 liters of Hydro-ChiTM water per day. You may require additional water to stay properly hydrated on hot or extremely cold days. NASA scientists believe that hydrogen could help protect astronauts from the cellular damage of cosmic radiation. Cosmic radiation is known to cause DNA and lipid damage which is directly connected with increased oxidative stress—commonly known as free radical damage. Free radicals are a major concern in space travel and also a big problem for life here on earth. Since, “No adverse effects have been found using drinking hydrogen water in a human study,” the scientists found the idea of hydrogen-rich drinking water to be a valid method of administering hydrogen to astronauts. A free radical is an atom or a molecule which contains an unpaired electron. Free radicals have extremely unstable configurations, quickly reacting to cause damage to cells. Free radicals can steal electrons from adjacent molecules such as DNA, lipids, or protein as shown above in illustration. Minerals in your Hydro-Chi water will have an extra electron. These electrons are able to freely move an electron without the need of enzymes. 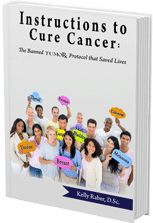 When an electron is donated by mineral rich alkaline water, the free radical becomes stable, thus it can no longer cause cellular damage. The free radical theory of aging (FRTA) states that cells prematurely age because they are constantly attacked by free radicals. Free radical — An atom or molecule containing an odd (unpaired) number of electrons. Oxygen can form free radicals by reacting with certain molecules. While important for some reactions in the human body, excessive free radicals cause disease and a host of domino effect problems. 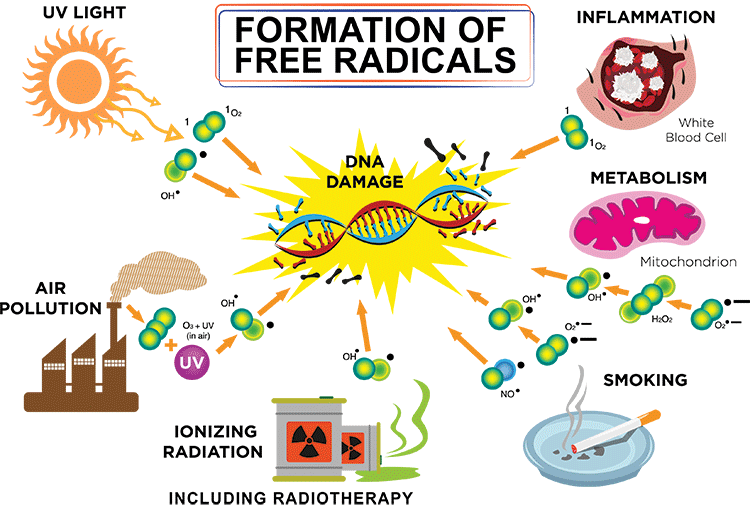 Free radicals are in the environment and can be induced by pollution, stress, allopathic drugs, unhealthy diet, and etc. The Hydro-Chi electrolyzes the water to generate hydrogen and alkaline and acidic water. 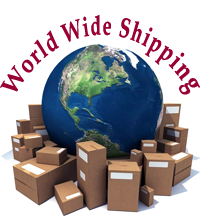 It has titanium and platinum alloy electrodes and an ion-exchange membrane~ all are made in the USA. The dividing membrane serves to prevent the two different types of water from remixing after electrolysis. An electric current is produced both at the cathode and at the anode. Electrolysis occurs in both chambers. The source water is first filtered through the 3-Stage water filters which consist of a sediment filter and 2 carbon filters. Next the filtered water is introduced into the electrolysis machine where it is filtered for the 4th time before finally being released into the Hydro-Chi. Since opposites attract, the positive water ions are attracted to the negative cathode. The negative water ions are attracted to the positive anode. Once the water is electrolyzed, the alkaline water from the cathode chamber is dispensed from the machine as the drinkable water. The acidic water from the anode chamber is dispensed through a separate waste hose or pipe as non-drinkable water. During electrolysis, hydrogen is separated from oxygen. 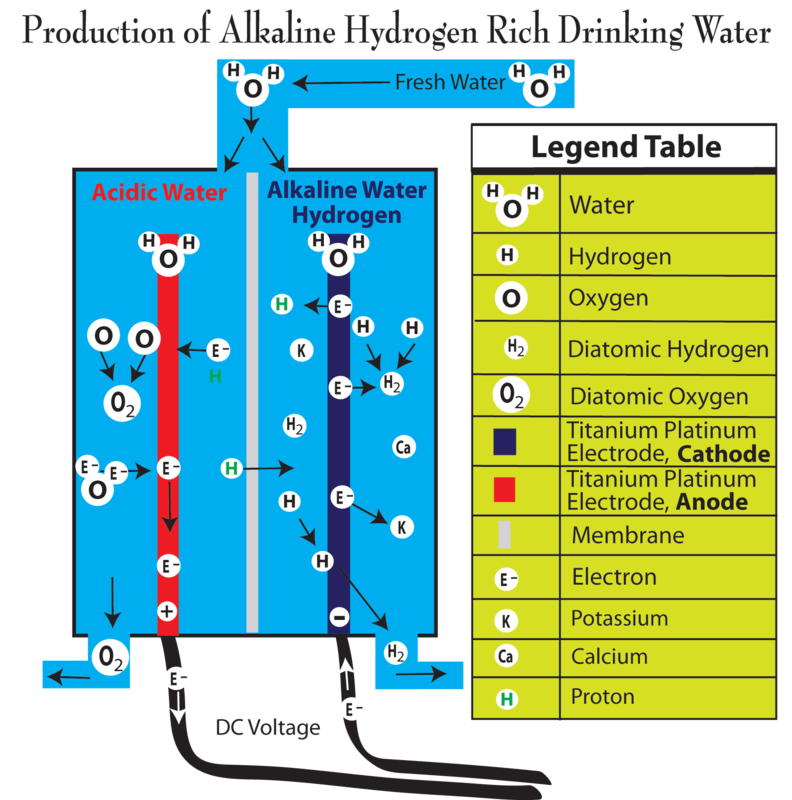 Hydrogen flows into the alkaline chamber while oxygen flows into the acid water chamber. Essential minerals like calcium, magnesium and potassium, are concentrated in the alkaline side of the water chamber. Chlorine, nitrogen, sulfate, carbon trioxide, and etc. are condensed in the acidic water chamber, where it can be removed as waste water. 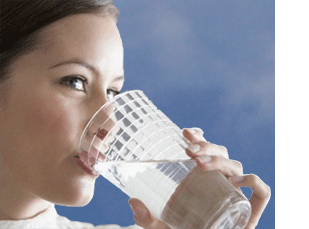 Your water should be clean enough to drink before installing a water alkalizing machine. Filters placed in-line prior to the electrolysis machine is the best method to insure a clean water source. With RO systems, a mineral deposit system placed in-line prior to the electrolysis machine will provide a mineral content high enough for the electrolysis machine to operate correctly. Water electrolysis will condense healthy minerals and liberate hydrogen, thus allowing the removal of free radicals from your body. So, whereas reverse osmosis removes toxins and almost everything else from the water, alkalizing machines condense the minerals and add free hydrogen to your drinking water. Clean drinking water is the first step to good tasting healthy water. Included with the Hydro-Chi is a 3-stage water filter system mounted on a frame. The frame is constructed of study metal, painted with white enamel. Mounting holes in the frame make it easy to mount under sink or whereever you desire. One sediment filter comes standard. Two activated carbon filters come standard. 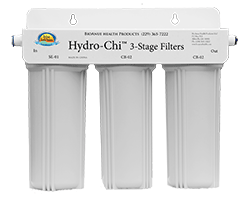 Attach the 3-Stage Water filters to your source water under the sink where you plan to install your Hydro-Chi. Attach the 3-Stage Water filter to the Chi Faucet fixture.